Many indoor horticulturists are turning away from using harsh chemicals in their gardens and, instead, are relying on effective, environmentally-friendly products to fertilize and protect their plants. Not only are organic and environmentally-friendly products better choices for the planet, they tend to be the best choices for maintaining the quality of an indoor crop. After working tirelessly for months to produce bountiful fruits or flowers, the last thing an indoor grower should do is taint his or her crop with a harsh chemical pesticide or fungicide. The unfortunate truth, however, is that pest insects and pathogenic fungi can rear their ugly heads at the most inconvenient times. To preserve the quality of the crop and protect it from further damage, cultivators need powerful pest insect controls in their arsenals. However, effective products don’t necessarily have to be derived from harsh chemicals. One company that specializes in earth-friendly pest insect solutions for indoor gardeners is Organic Laboratories, Inc. Perhaps best known for its Organocide line of environmentally-friendly products, Organic Laboratories has helped many horticulturists protect their plants from pest insects and pathogenic fungi without having to compromise the quality of the plants. Organic Laboratories, Inc. is one of the country’s leading developers, producers, and marketers of earth-friendly pesticides and fertilizers. Its diverse product line provides solutions to a wide variety of horticulturists, including indoor gardeners. Many of the products offered by Organic Laboratories are OMRI (organic material review institute) listed, which means they are approved for organic production. OMRI supports organic integrity by providing an independent, third-party review of products intended for use in organic production, handling, and processing. The Organocide product line is not only earth-friendly, but also, when applied as directed, safe for use around children and pets. In addition to its organic products, Organic Laboratories offers cutting-edge products through its Plant Doctor® line. Their retail products are tried and true with success first in the agricultural market. They are essential for creating long-lasting vitality, abundant yields, and healthy overall growth. 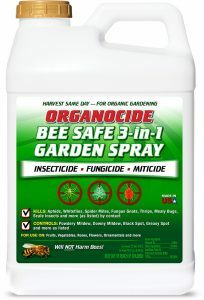 Organocide Bee Safe 3-in-1 Garden Spray is an OMRI listed insecticide, fungicide, and miticide. This powerful formula is comprised of FDA-approved ingredients for organic production. Indoor growers will appreciate the fact that this potent product is capable of killing the eggs, larvae, nymphs, and adults of over 25 soft-bodied insects. A partial list of pest insects that can be killed with Organicode Bee Safe 3-in-1 Garden Spray includes aphids, chinch bugs, citrus rust mites, flea eggs and larvae, fuchsia mites, fungus gnats, hemlock wooly adelgids, leaf-rollers, mealy bugs, psyllids, scale, spider mites, thrips, and whiteflies . Though many pest insects can affect an indoor crop, the four most common pest insects that cause trouble for indoor horticulturists are spider mites, thrips, fungus gnats, and root aphids. Organocide Bee Safe 3-in-1 Garden Spray can effectively treat all four. In fact, Organocide Bee Safe 3-in-1 Garden Spray can be used as an effective soil drench to eliminate root aphids. The overall effectiveness of this product as an insecticide and miticide can be understood by the way it affects the pest insects. The dense oil contained in Organocide Bee Safe 3-in-1 Garden Spray will smother target pest insects on contact. Pest insects are unable to develop a resistance to the fatty acids found in the oil and that are toxic to the targeted pest insects. 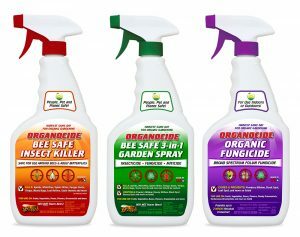 Organocide Bee Safe 3-in-1 Garden Spray works great as a contact killer, but what makes it so unique is its powerful residual effects. Once the applied liquid dries, a micro-film is left on the plant. Any pest insects that hatch will get trapped in the micro-film and die. Female pest insects that arrive after a treatment will detect the micro-film and will not lay eggs on the treated plant because they recognize the area as being hazardous to their eggs. Since it is specifically designed to affect only pest insects and not beneficial insects (such as bees, butterflies, or ladybugs), the friendly pollinators can continue to feed on any new pest insects that arrive. It is even safe enough to use around fish, ponds and streams. Organocide Bee Safe 3-in-1 Garden Spray can also be used as an effective fungicide against fungal diseases, such as, but not limited to, powdery mildew, downy mildew, black spot on roses, septora spot, bacterial tomato spot, citrus greasy spot, and helminthosporium. The key to this product’s effectiveness as a fungicide is the way it deprives the disease spores of the necessary moisture they need for propagation. It also protects the plants from germ tube penetration, which limits or eliminates the spreading of pathogens, like powdery mildew. Another stand out product from Organic Laboratories, Inc. is Organocide Organic Fungicide. This organic formula comes ready-to-use and is designed to eliminate a wide variety of plant fungal diseases. 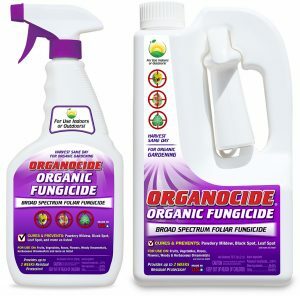 Developed by renowned Cornell University plant pathologist, Dr. Ken Horst, Organocide Organic Fungicide has undergone extensive independent testing at leading universities, including Cornell, Ohio State, Miami, Purdue, Long Island Horticultural Research Station, the University of Florida, and Michigan State. In over 200 university trials, Organocide Organic Fungicide has been proven effective as a preventative and a curative for over 25 diseases, e.g. powdery mildew, black spot, leaf spot, and botrytis. Plant Doctor Systemic Fungicide is an earth-friendly broad spectrum systemic disease control and preventative. Though most systemic fungicides are applied to the roots, Plant Doctor Systemic Fungicide can alternatively be used as a foliar spray. This product works by slowing down the metabolism of the disease or pathogen, inhibiting its ability to absorb nutrients, which, in turn, starves the disease pathogen. At the same time, the host plant’s immune system is boosted and strengthened, making it more resistant to the disease. What makes Plant Doctor so unique is that after 14-21 days it converts into nutritional potassium and phosphorus that the plant consumes as nutrients, which results in more bloom to flowering plants. Plant Doctor Systemic Fungicide is available in concentrate only and in sizes ranging from a pint to 250 gallon totes (for agricultural applications). When pest insects or pathogenic fungi make their way into an indoor garden they must be treated and eradicated as soon as possible. If left to their own devices, pest insects and pathogenic fungi will quickly destroy an otherwise healthy crop. Finding a safe, but effective, treatment is the key to not only eradicating the problem, but also protecting the integrity of the crop’s quality. Experienced indoor growers understand that a pest insect or fungal disease can quickly ruin a crop, but so can a harsh chemical treatment program. This is why companies like Organic Laboratories, Inc. are so valuable to indoor cultivators. With products like Organocide Bee Safe 3-in-1 Garden Spray and Organocide Organic Fungicide, horticulturists can still meet the strict standards of organic crop production and effectively eradicate harmful pest insects and diseases. Indoor growers work very hard to produce a potent and productive crop. Pest insects and fungal diseases that can rapidly diminish a crop’s yield can also have a negative impact on overall potency. By choosing an effective, earth-friendly solution from Organic Laboratories Inc., both indoor and outdoor growers can rest assured they are protecting their crop’s yields without diminishing or tainting its potency. Organocide Bee Safe 3-in-1 Garden Spray is available as either a RTU (ready-to-use) or a concentrate and ranges in size from a quart to 250 gallon palletized totes (for broad scale agricultural applications), making it convenient and compatible for any type of gardener. For more information, call 772.286.5581 or visit YourPlantDoctor.com.